As part of the institute’s commitment to education, each year we host a class of Student Innovators who spend the summer working side by side with our investigators. Throughout the summer, Larry will provide commentary about the experiences of the Student Innovators. Here's his first post. arrived as a Student Innovator. My name is Larry Kim and I am a 23 year old student innovator at the Summer Student Innovators Program at the Sheikh Zayed Institute for Pediatric Surgical Innovation at Children's National in Washington, DC. I received my Bachelor's of Science in Health Sciences with a concentration in Public Health Education from James Madison University in 2010. I will be receiving my Master of Public Health degree in Public Health Policy and Practice from the University of Virginia in August of 2012. As an academic in the field of public health and a frequent patient of the health care system, I will share my own patient-first perspective of my experiences here at the 2012 Summer Student Innovators Program. What is innovation? What does innovation mean? Innovation is a term that can take on many meanings. At the Sheikh Zayed Institute, innovation means a future in which pediatric surgery is more precise, less invasive, and pain free. For me, innovation takes on a slightly different meaning. As a patient who has been hospitalized over 15 times in the past 5 years, innovation represents a pillar of hope. Hope that one day there will be a cure for juvenile diabetes; a disease I have lived with since 2006. At the age of 17, I was involuntarily thrust into the realm of healthcare. In 2006, just a week before the start of my freshman semester at James Madison University, I collapsed in my home and was admitted to a local hospital. Once there, I was diagnosed with acute liver failure stemming from a severe allergic reaction to medication. I was flown by helicopter to a hospital specializing in liver transplantation, where I remained in intensive care awaiting a new liver to arrive. Doctors informed my parents that without a new liver, my chances of survival were slim. After spending close to a month in intensive care, a miracle happened; my liver began to heal itself. I spent the next few months rehabilitating, developing type 1 diabetes in the process, and moving in and out of hospitals, countless times, as I faced complications. My experience as a patient in the healthcare system has been less than ideal. But it has only been through these experiences have I developed a passion for change, a passion for innovation, and a sense of hope that the world will one day be free of diabetes. At the Summer Student Innovators Program we all share a common passion: a passion for change. Although we may have different ideas and perceptions of the word "innovation," our belief in a better tomorrow unites us. The 14 student innovators come from different occupations and backgrounds. Some of us have medical or clinical degrees, while others have advanced degrees in business or public policy.. Some have traveled from as far away as Nova Scotia and the United Arab Emirates to participate in the program. What I have learned here is that innovation cannot be summarized by a single phrase or definition. Instead, innovation is a shared belief that the present state of healthcare is simply not good enough. We all believe that change is possible. And it is this belief that brings us together. If we can come together and truly believe in this change, than there will always be hope for a better and brighter tomorrow. 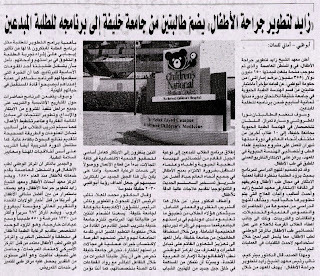 For the second year in a row, the Sheikh Zayed Institute sponsored the Award for Innovation in Pediatric Surgery at the American Pediatric Surgical Association Annual Meeting. The award goes to the most innovative abstract presented at APSA's Innovation Session. This year's awardees were a multi-disciplinary team of surgeons, engineers, and innovators in the Department of Pediatric Surgery, College of Architecture and Urban Planning, and Medical Innovation Center at the University of Michigan.Their presentation focused on a prototype isolation bed for pediatric neuroblastoma patients undergoing treatment with a targeted radioactive particle called metaiodobenzyguanidne (MIBG). 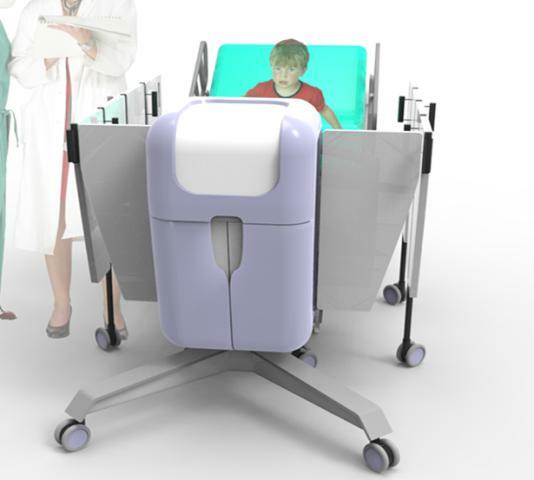 The bed is designed to protect professional caregivers and families from the side effects of MIBG treatment, while creating a child-friendly isolation that provides the child with safe interaction and electronic distractions from treatment. 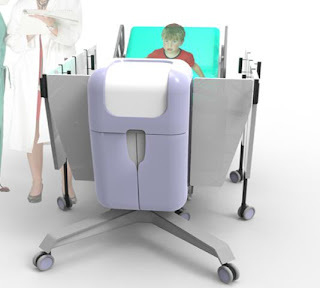 Rendering of the protoype isolation bed in action. Dr. Sabina Siddiqui, who presented on behalf of the team identified a great and common problem in pediatric device development: “Like many pediatric diseases, neuroblastoma affects such a small population of children that there will never be a solid business case to take on design and development. Instead, at present, the centers that provide treatment have been forced to improvise solutions." Read the media release to learn more. 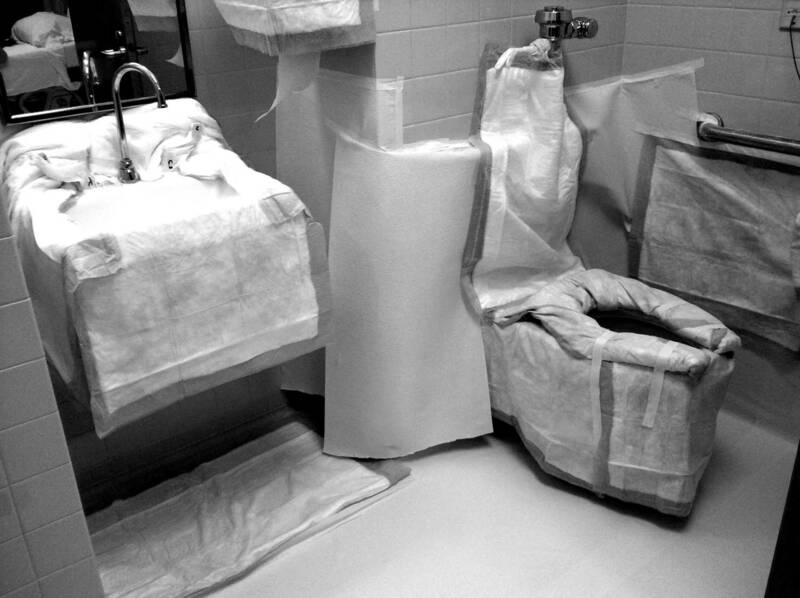 This approach of draping the entire bathroom is an example of the current typical improvisation that was used to prevent the spill of radioactive fluids while the patient is undergoing treatment. Many of Children's surgeons are active participants in APSA, and this year, in addition to the award, Anthony Sandler, MD, Senior Vice President for the Joseph E. Robert, Jr., Center for Surgical Care and a principal investigator in the institute, was invited to speak as part of a panel about basic science in pediatric surgery. He discussed how surgeons might accelerate the timeline of developing basic science research into clinical practice, or truly creating translational research. His talk focused on the Sheikh Zayed Institute's model, which was created precisely to speed up the pathway that takes research from the laboratory to the bedsides of patients who need it. From left to right: Dr. Newman, CEO of Children's National, Dr. Shamberger, the immediate past president of APSA, Dr. Siddiqui, who presented the award winning research, and Dr. Sandler, Senior Vice President of Children's Joseph E. Robert, Jr., Center for Surgical Care, at the APSA awards dinner. Pioneering robotic surgery expert Craig Peters, MD, who is a Children’s National urologist and principal investigator in the Sheikh Zayed Institute, recently spoke at Children’s weekly Grand Rounds about the current and future state of surgical robotics. 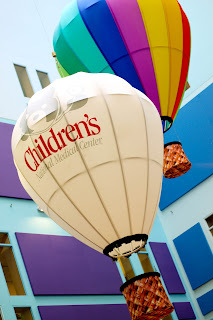 Dr. Peters outlined the history of pediatric robotic surgery, which so far has focused on finding pediatric applications for the da Vinci Surgical System, the well-known current standard in robotic surgery for adults. Dr. Peters performs a pediatric urology procedure with the da Vinci Surgical System at Children's National. 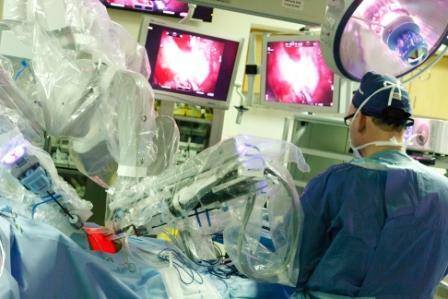 But now, reducing complications and recovery time for patients and easing access for surgeons has become the primary focus for further development of surgical robotics. In pediatrics, usage has been relatively flat in the 10 years since Dr. Peters and his colleagues first used the da Vinci System at Boston Children’s. However, recent years have seen an increase in usage and applications as research studies conducted by Dr. Peters and others have shown the approaches are safe and effective, and more children’s hospitals acquire robots. 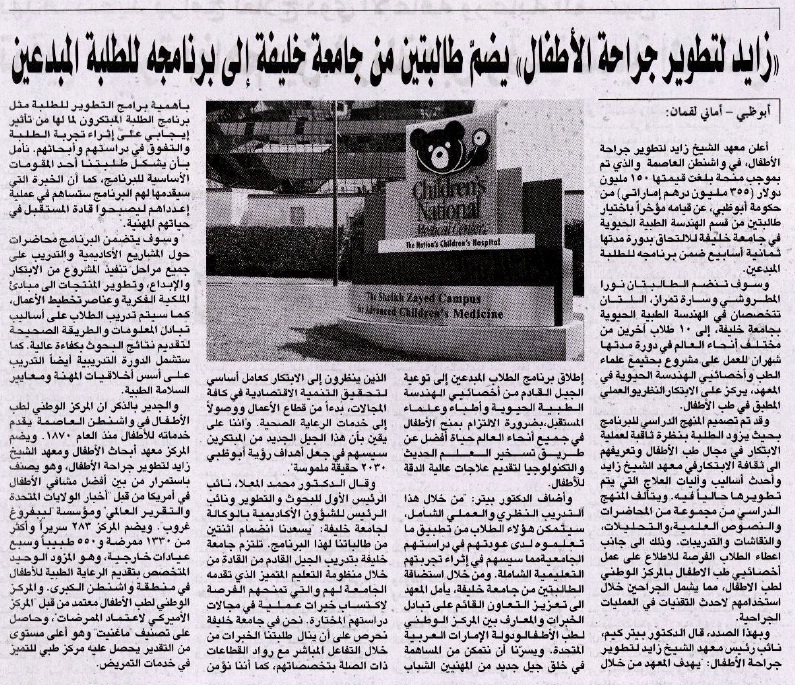 Children’s National recently acquired a da Vinci Surgical System with the support of the Sheikh Zayed Institute, and Dr. Peters with his multi-disciplinary team began performing pediatric robotic surgical procedures late last year. Even if research finds that the da Vinci Surgical System procedures are on par with other laparoscopic approaches, Dr. Peters pointed out that, given its additional flexibility and maneuverability, it will remain an advantageous tool for procedures with difficult access points, and its contribution as proof of principle for technology use in the OR will be its real legacy.